We had planned to go to El Nido ever since we visited Puerto Princesa about 2 years ago. So it was good news when our office announced that we will be going there and that we can take along immediate families (of course at their own expense). Our office was able to get a round trip fare for around P4,000 each: via Cebu Pacific going to Puerto Princesa and via Superferry returning to Manila. The entire trip would take 6 days which includes the trip via the Superferry that will take more than 24 hours. We took the 2:30 PM flight on 30 April to Puerto Princesa City. However, the flight was delayed and we took off at past 4:00 PM for our 1 hour trip. We were supposed to take a city tour uponarrival. However, because of the delay, it did not push through. Upon arrival in Puerto, we went straight to San Pedro Elementary School, where we will be staying for the night. We had dinner at the Skylight Apartelle. After dinner, we went back to the school to rest for the 6-7 hours trip to El Nido the following day. With about 30 people in the group and a few bathrooms available in the school, some opted to take their shower before going to bed since we will be leaving Puerto at around 5 AM in the morning. The following day, Labor Day, we finally left the school at around 5:30 AM in 3 vans and 1 pick-up. The road from Puerto Princesa to Roxas, which took about 2 hours, was mostly concreted. We stopped by at Magara School for Philippine Craftsmen in Roxas where the school had prepared some breakfast for us consisting of bibingka, boiled plantain (saging na saba), puto and hot coffee. After a heavy breakfast, we continued on our way. Most of the roads after Magara are still unpaved but a lot of portions have began to be concreted. There is only one more town before we reached El Nido: Taytay, the municipality where Club Noah Isabelle and the Malampaya gas field is located. We rode for more than four hours, stopping only to relieve ourselves. 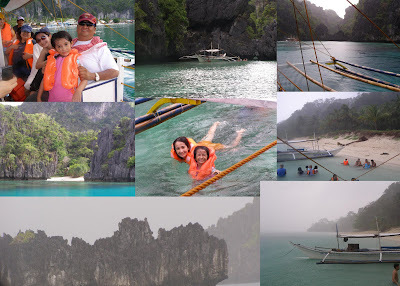 Finally, at around 1 PM , we finally saw the limestone cliffs El Nido is well known for. We dropped by the Municipal Hall of El Nido to meet with the municipal budget officer who helped us in finding our accommodations. 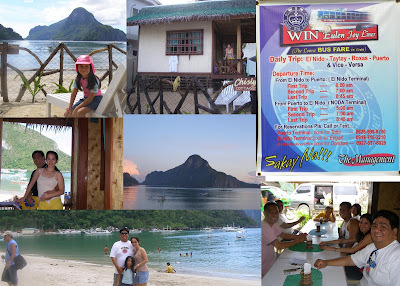 Because of our large group, we were checked in at 3 different places: Marina Garden Beach Resort, Chislyk Cottages and another one just across El Nido Beach Hotel. Our family was checked in at Chislyk cottages, which I think has the best location as its cottages are right infront of the beach and being made of native materials, the place is cooler especially during long brownouts (In our two night stay, we experienced a few hours power outage on the first night and no electricity during our entire second night. The town claims to have electricity between 12:00 noon - 3:00 PM and 6:00 PM to 6:00 AM). Since we only have about a day and half to stay in El Nido, right after checking in our rooms and having lunch, we hired 2 boats to take us around the bay. The boatmen first took us to the small lagoon to do some snorkeling. The lagoon is enclosed by tall limestone cliffs. From the clear green-colored water, one can see the corals as well as the fishes swimming around. There are kayaks in the area, probably being rented out for visitors. Unlike in Boracay, and some areas around the Philippines were snorkelers and divers are charged an environmental fee, I think this is non-existent in El Nido. However, since many of us preferred to go to the beach, we decided to leave the small lagoon. After a while strong rains started pouring accompanied by thunder and lightning, forced us to move to another place. The boatmen, took us to 7 Commando beach where it is claimed that the sand is powdery white. There were lots of jellyfish near the beach. The rain continued to pour when we got to the place and despite the thunder and the group still proceeded to go on swimming along the beach. After about 30 minutes, we decided to head home as it was getting dark. After returning to town, we took our shower and waited for dinner which was in a restaurant at the other end of the beach where we stayed. However, when we were about to go there the power went off. There was still some light so it was not difficult to go there by foot. I don't remember the name of the restaurant but there was still no power when we returned to our cottages. We walked along the beach going back using our flashlights. The following morning, the ladies chopped a lot of onions, tomatoes and chilis which will be made into a salad to complement our grilled fish that our boss bought from the market. There was so much fish and variety that I don't think we were able to consume everything for lunch. Having bought the fish, drinks, rice and the salad prepared, we got to to the boat and proceeded to a beach near the Big Lagoon where we planned to set up for lunch. Our boss was the one who led the group who will cook the fish while drinking some of the beer we brought, while the rest enjoyed swimming in the cool water, and still the rest went to the Big Lagoon to do some snorkeling. Lunch time brought everyone to the beach to partake of the lunch that was prepared by our boss. Everyone was so full, that we had to rest first before going back to the sea for some more swimming. 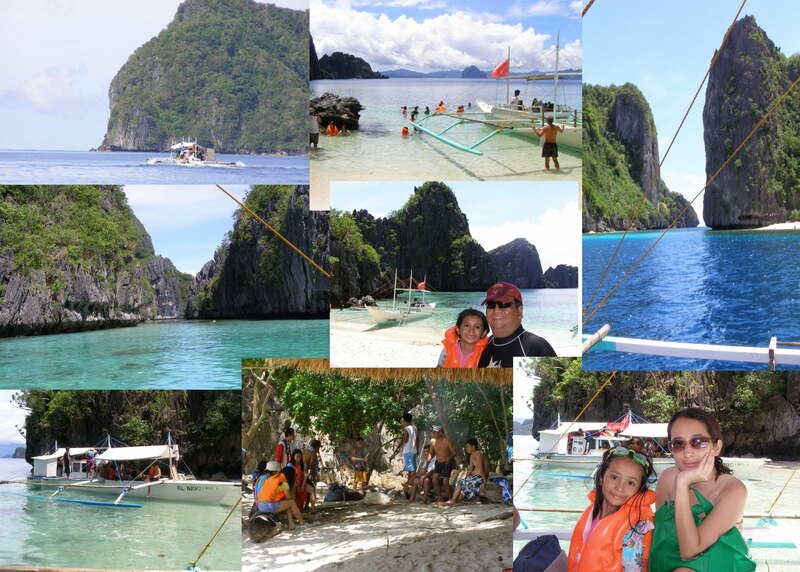 After a while, we got on the boat again and visited another island which passed by the Lagen Miniloc resort. The water between the two limestone formations were quite strong so we decided to stay near the beach. There was some fish and rice left from our lunch and that's what we had when we got back from a day of island hopping. We were so tired that we decided to call it a day early. The following morning, we got up early and prepared for our trip back to Puerto Princesa. We still had some more photo ops before finally leaving the place. On our way back, we stopped at the town of Taytay to visit Fort Taytay and have lunch. We stayed at the elementary school where we earlier slept before going to El Nido since our ship bound for Manila leaves Puerto in the morning. The trip took us about 24 hours, stopping in Coron on the way back to Manila.